The property at 325 Shetland Road is on the market for $1,095,000. Use the term "split level" and chances are most people think of a house style popularized in the 1950s; one rarely built for today's homebuyers because that style is now considered outdated with little relevance to the 21st century. In fact, many split levels in town have been demolished to make way for new construction. 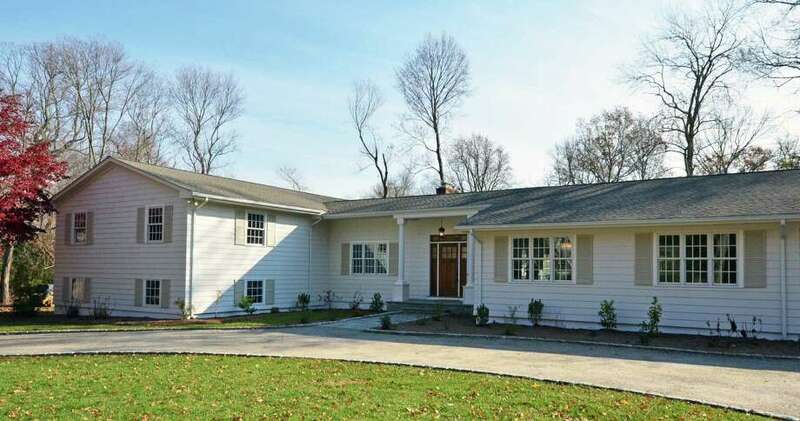 The cream-colored split level ranch house at 325 Shetland Road was spared the wrecking ball, and it has undergone a major face lift improving its appearance inside and out, as well as functions. This house was well built in 1970 and surpasses its original construction with all the improvements that were made in a recent, extensive renovation during which the house received a new roof and new eight-over-eight double-hung windows. Some floors were refinished and new hardwood flooring was installed in some rooms. The renovation also gave this house energy-efficient features, among them ceiling fans, ridge vents, tank-less hot water that ensures hot water does not run out and Thermopane-insulated windows. The house also now features an open floor plan, spacious gourmet kitchen with Thermador appliances, two-tiered wood deck and patio in the backyard, a fresh coat of paint, and crown molding on the main floor and both bedroom levels. The house sits on a 1-acre, level corner lot at the intersection of Galloping Hill Road in the lower Greenfield Hill area. From the curbside view, it looks like a ranch on one side with a split level wing. Inside, the main level contains the common living areas -- family and dining rooms and kitchen. The wing has the upper and lower levels, both have bedrooms. From the outside the house is deceptive. It looks much smaller than it really is. Inside, there are four levels of living space -- five if you count the walk-up attic -- comprising 4,544 square feet. The finished lower level provides an additional 1,200 square feet of living area with a yellow brick fireplace in one of the three rooms, wall-to-wall carpeting and French doors separating one room from the other two. There are front and back staircases to the lower level. The first floor has two powder rooms at opposite ends of the house -- one in the mudroom and one in the foyer. This house is uniquely designed, not just for a split level but in general. What is missing from immediate view as one enters the house from its covered, columned front entrance is the living room. Instead, the great room or family room comes in to view. The living room is on the opposite side of the formal dining room. The thinking behind it is that in this day and age few people spend time in a living room. Most family members and party guests hang out in the great room or kitchen. In fact, the space designated as the living room is flexible space and could be used as an office, den, library or other function. The great room is quite large and features a cathedral ceiling, floor-to-ceiling stone fireplace, exposed beams, a wall of windows along the back of the house, and sliding doors to the deck and patio. This room is open to the kitchen, which features Carrera marble counters, a long center island topped with the same marble and white subway tile backsplash. In the mudroom there is a walk-in pantry and five cubbies with storage above and below. It provides access to the two-car attached garage. In the first level of the sleeping wing there are three bedrooms, a full bath with a marble counter in the hall and a door to the backyard. The staircase to the upper level has a decorative wrought iron railing. This level has the master bedroom suite and a guest bedroom en suite with a huge walk-in closet, especially for a secondary bedroom. The closet has an automatic light that goes on and off as the door is opened and closed. For more information or to set up an appointment to see the house, contact Kelly Higgins of Coldwell Banker Residential Brokerage at 203-650-3483 or email her at kelly.higgins@cbmoves.com. Visit www.325ShetlandRoad.com for more details.